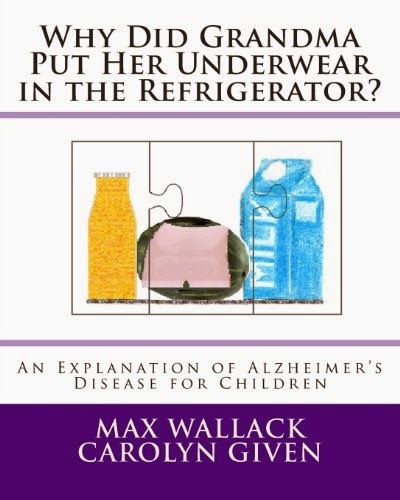 Two days ago I posted my review of Why Did Grandma Put Her Underwear in the Refrigerator? by Max Wallack and Carolyn Given. (Read my review) This is an excellent book to help children learn about Alzheimer's, a disease that is striking many today. I was so impressed by Max, one of the authors because he is only 17 and has already accomplished so much. I think this book is so important that I am giving away a copy to one of my readers. But before I tell you about the giveaway, please help me welcome Max to Library of Clean Reads! LCR: Hi Max! What made you want to write a children’s book about Alzheimer’s? 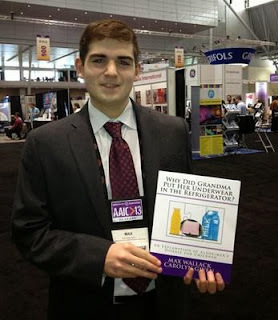 MW: I grew up being a caregiver to my great grandmother who had Alzheimer’s disease. I felt I had a lot to share with other child caregivers. I wanted to provide them with an explanation of the disease that would be non-scary but would provide them with some useful coping mechanisms so they could still continue to have meaningful relationships with those suffering from this disease. LCR: That's wonderful, Max. If there was one message you want to give caregivers, what would it be? MW: I would want them to know that the person is the same person they have always been. They have not changed into someone else or into a stranger. They are still capable of more than many people think. It is important for caregivers to find modes of communication that are still working. LCR: I agree. You were young when your grandma was diagnosed with Alzheimer’s. Do you think children and teens can play a role in helping families cope with this illness? LCR: Those are some sobering statistics. I’ve seen books for children to help them understand Alzheimer’s but few ones for teenagers. 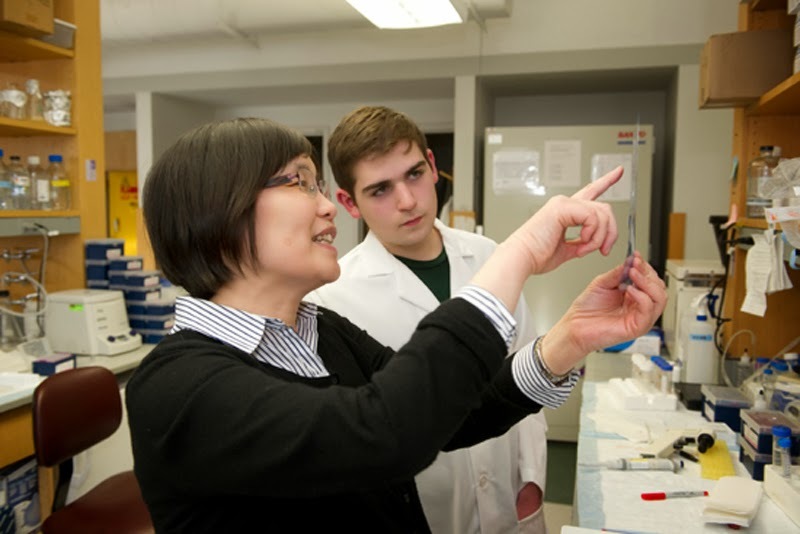 Being a teenager yourself and being involved in research for Alzheimer’s, you are an inspiration. Do you see yourself writing another book, but this time for teens? MW: Not any time in the near future. In the past few months, I’ve actually been asked to coauthor several books, but I just don’t have the time right now. As a 17 year old college junior and an Alzheimer’s researcher, as well as managing PuzzlesToRemember, I keep pretty busy. I am very enthused about some of the research I am doing right now, which seems to be getting some very encouraging results. We are applying to begin clinical trials and I think my time is best spent on this work. I will also soon be beginning the process of applying to medical schools for 2015. LCR: That is amazing! No wonder you have been referred to as a whiz kid. You started a non-profit organization when you were just 13. Why? MW: I actually started PuzzlesToRemember when I was 12. During the last few months of Great Grams’s life she was in and out of several hospitals and nursing facilities, mostly because of urinary tract infections that often accompany incontinence. Whenever, I visited her, I noticed that patients who were working on jigsaw puzzles seemed calmer and “more there”. After Great Grams’s death, I researched this and discovered that remaining cognitively active, especially with creative endeavors, can help postpone the point at which an Alzheimer’s patient can remain cognitively functional in society. I began collecting puzzles and distributing them to facilities caring for Alzheimer’s patients. Soon, I realized that the type of puzzles Alzheimer’s patients needed, those with low piece count, large piece size, bright colors, and memory-provoking non childish images, were hard to find. I wrote to Springbok puzzles and asked them to start producing puzzles for this audience. Their response was, “We can and we will get this done.” Since then, we have worked together to produce the Springbok PuzzlesToRemember. I accept no royalties for my efforts. Instead, each year Springbok gives me an allotment of puzzles that I can direct to be sent to any facility in the US at no cost to myself or to the facility. By now, PuzzlesToRemember has distributed over 26,000 puzzles around the world. LCR: That is such a generous act. I thank you immensely for the puzzles you sent our non-profit community centre. Okay, let’s get to know another side to you. If you could travel back in time, where would you go? MW: I’d rather go forward in time and see what advancements have been made in various fields. LCR: Thanks so much, Max! It's a pleasure for me to help you promote your book and your work, knowing you will be an inspiration for young ones. My son was impressed with you too and asked me if he could write a book too. If you want to buy a copy of this wonderful book, visit Amazon. Fifty percent of this book's proceeds supports Alzheimer's research and the care of Alzheimer's patients! Max has an impressive resumé. He began to take university courses while still in high school and began lab work when he was just 15! He has been interviewed on CNN, Metro West Daily News, The White House Blog, Fifty Plus Advocate, and AARP The Magazine Blog. You can learn more about him on his website: www.PuzzlesToRemember.org. He is also an editor for the AlzheimersReadingRoom.com, and you can read his most recent article here. 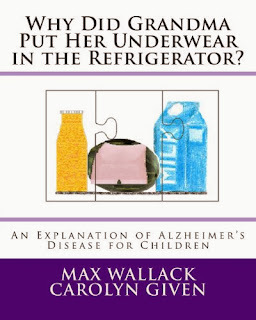 I am giving away one copy of Why Did Grandma Put Her Underwear in the Refrigerator? to one of my readers. Entering is easy. 2) Leave a comment on the review post for this book for another chance to win. *Giveaway ends November 25, 2013.